Does your pond need a face lift? Or, did your new home come with a water feature or pond in need of repair or general maintenance? In Northern Michigan, there is only one water feature and pond specialist- Waterpaw Ponds. We are a dedicated to the ponds of Petoskey, Harbor Springs, Walloon Village, Boyne City, Charlevoix, Torch Lake, Bellaire and beyond. Over time ponds need a little pick me up. Think of it as an occasional "pond redecorating" for your yard. Just like your deck or patio occasionally needs new stain or a deep clean your pond needs care. Perhaps you have remodeled your home and now your views to your yard have changed. This would be a perfect opportunity to adjust the site lines of your water feature or backyard pond. Or, have you recently added an outdoor kitchen? Wouldn't it be wonderful to tie your pond into your outdoor dining experience by winding a stream next to the patio or adding another waterfall for ambiance? 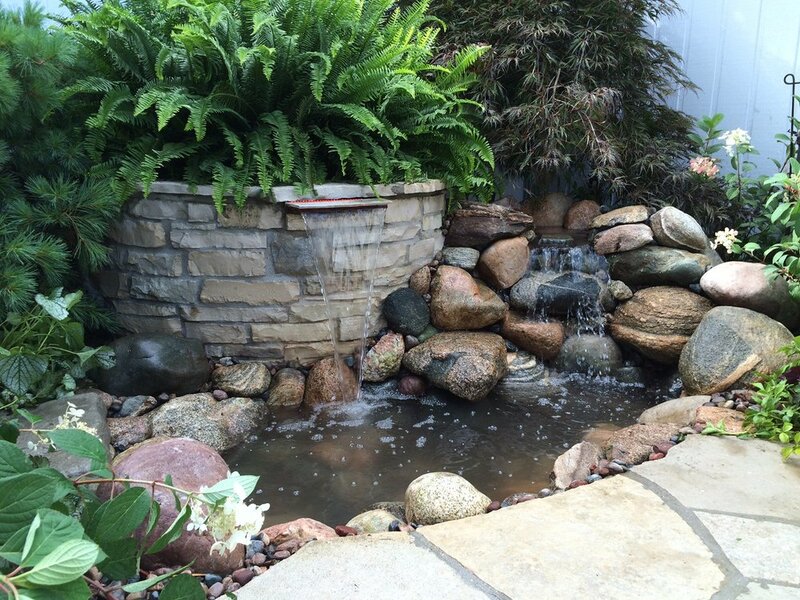 We here at Waterpaw Ponds in Northern Michigan strive to offer our clients water features that will be part of the yard and home life for decades to come with a solid foundation and natural filtration. Some other builders in the area don't and we service several ponds every season that have failed due to poor infrastructure put in by other companies. Your pond should be beautiful and worry free. So, if your pond is looking a little worse for wear or not functioning properly give us a call or email and let's get you back to enjoying your yard! Make your pond functional and beautiful again! Call Waterpaw Ponds to repair your pond. After our crew repaired and enhanced this fountain the client had a brand new entryway!